WIM Mariam Danelia is from the country of Georgia, located west of the Black Sea in the Caucasus mountain ranges, south of Russia. At only 22 years of age, she has already accomplished what many people can not achieve in a lifetime. She learned to play chess when she was only 5 years old. She won the FIDE World Youth under 12 section before she was even a teenager. 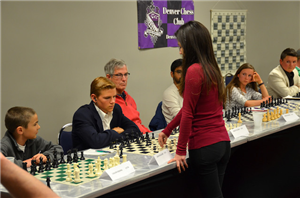 Then playing in the FIDE European Championship under 16 section she won a full ride scholarship to the University of Texas at Dallas with her 1st place finish. To make Mariam's accomplishment even more impressive, to actually receive the prize, she had to take the SAT test which is of course written in English. So, with only a slight exaggeration, Mariam learns English overnight, and passes the test with flying colors. She is currently in her 3rd year at UTD studying business and finance, and easily maintaining the GPA required for the scholarship. Approachable, with a pleasant easy going personality, Mariam's lecture before the simul was both entertaining and informative. She showed the 40-50 people attending a complex game were she was worst out of the opening and "had to change the nature of the game". So she sacrificed a Knight and gave her opponent many chances to get mated. She engaged the audience with "what would you do here" questions. Only Kevin Seidler could find the "gold star" moves. Her comment to Kevin was along the lines of, I'm glad you're not playing in the simul. :-) The shown game ended in a draw, but only due to her opponent finding the only move over and over. The DCC was pleased that we filled the 25 available seats for the simul, but unfortunately several players had to abandon their game as midnight approached and it was apparent that some games would not be finished till the wee hours of the morning. I believe Mariam was playing slow and cautiously, so the DCC would not have to pay out any prize money for a win or draw. But, alas, it is not easy to play 25 games at once against strong players and win them all. Mariam made Andy Wu's day and half the night :-) when he won. John Brezina also won when Mariam slipped up after a grueling 6 hours of walking from one board to the next. John was kind enough to donate his $100 prize to the DCC. Thank you, sir. The Williams family of chess players was again at this simul. Josh Williams drew GM Gareyev and here his brother, Jesse, drew WIM Danelia, The Williams sisters, Teah and Selah, caused Mariam to chew up lots of time with pretty much every move. These Williams kids are tough on these international players :-) Also drawing the WIM was Dean Clow and Daniel Herman. I didn't see Daniel's game, but I thought beforehand that he might be able to win. Dean played out of trouble and offered the WIM a draw from a position of strength. He also refused to accept his prize. Thanks, Dean, and thanks for all the work you are doing for the DCC. A future WIM preparing to move. The DCC feels that bringing an international player to our major weekend events is certainly a tournament experience enhancement. I mean how often do Colorado players get the chance to play a world class player over the board? Whether we will be able to continue to do so without a sponsor will need to be evaluated. We would like to hear some feedback as to whether players would rather have, say, a Friday evening warm up blitz tournament, or should we continue to arrange a simul with a titled player? Thanks to all who played in the simul and all who attended the lecture, and thank you, Mariam Danelia. What a charming person you are.